happy hour indiblogger Now, get a better car through Quikr NXT! Everyone is changing, everything is changing! While walking on a road, if you pause for a moment and look behind, you would notice that everything is different. People are upgrading their lifestyles. They want something new and it’s the wise who obtains the new from different things available to them. The world is transforming rapidly. Prior to the 90’s there was much less development about internet and science and now you would find a device for almost everything. Many must be having lots of dreams. Of course people dream and the best one fulfills all his dreams. How many of you own a car or dream of owning a car some day? There might be cases where you had a car in your mind but unfortunately you couldn't buy that because you couldn't afford it. Perhaps your budget was less! So in that case you had to be happy with little things that life has to offer you! Why fret? Quikr is an online website where people buy and sell their stuffs. I have been saying that since long. I have used this portal to sell several of my unused stuffs such as iPod and many devices. The advantage of using this is that you don't have a middleman. You post your ads and there is someone willing to buy your product. Quikr NXT is an enhanced version that incorporates several interesting features. It has a chat feature where you could directly communicate with the person and talk to them regarding the transaction. You can post your product details; requirements etc to them and convince them how good your product is! You could discuss about various specifications, quality features of your product. This is the value add that Quikr NXT has to offer! Isn't that amazing? 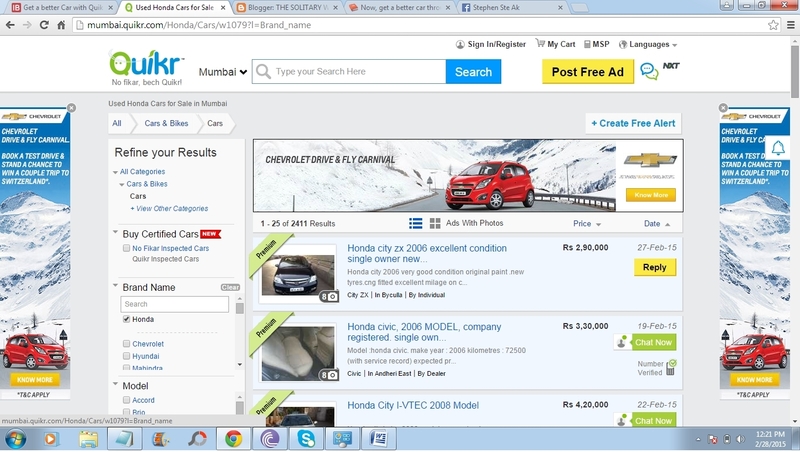 The Quikr homepage shows a grid of categories where you could find the Car & Bikes section too. Clicking on that grid would lead you to a fresh page that contains various Car brands - Maruti Suzuki, Toyota, Tata, and Honda to name few. Clicking on any of those brands will take you to a listing that contains different ads about the different models of that car brand. I clicked on the Honda brand and I could see ads related to City, Accord, Civic and different car models of the Honda brand. Aside, you would see various filters that would let you filter on the basis of different aspects such as Brands, models, Price Range, Fuel Type, Year, Color, Location, Used/ New and many more. Using these filters, you would refine your search process to the next level and get specific details about your requirements. You could create Alerts about your requirements and whenever an ad posted meets your requirements then you would be alerted through email and sms. If you like a car model, then you could talk to the concerned individual and take the deal discussion to the next level. The one to one communication through the chat messenger services various benefits. You could have your chat conversation with different sellers saved. You could request for a quick photograph of the concerned car that is to be sold. You could get various specifications and so on. I can buy the best car out of the bests as per my requirements. You could directly chat with the seller instead of a phone call. Isn't this awesome? If the deal strikes and you feel your dream car was a little too expensive than your budget, then you could sell your existing car and upgrade it through Quikr by discussing with the ad poster. So upgrading your car is just a website away. Why wait? Type www.quikr.com on your browser or better download the android, iOS or the windows app for your smart phone and start buying and selling cars quickr.